How do you know if your child is ready for an activity? Observe their sensitive periods, try an activity and if they maintain interest then continue. If not, look for ways to adapt it to their level or interest. 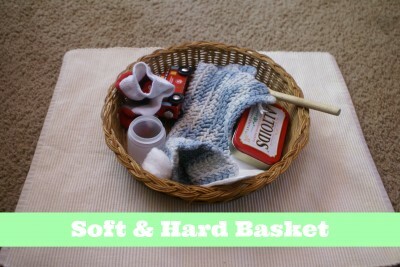 The soft and hard basket is a simple activity drawing the child’s attention to the difference in firmness between objects. For this activity, I gathered four hard items and four soft items from around the house. When presenting this activity, take the items out one at a time. Laying it on the mat state whether it is hard or soft, with soft objects on one side and hard objects on the other. For example, if I took the sock out of the basket I would turn it over in my hands feeling it and then say, “This is soft.” I would invite the child to feel the sock, when they’re done I’d take the sock and say again, “This is soft,” laying it on the soft side of the mat. Remember when presenting lessons it’s important to keep your words simple and not to embellish. There’s no need to say, “This is a sock. The sock is soft. Do you think the sock is hard or soft?” The fewer the words, the better. 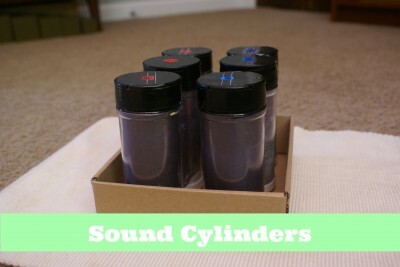 Sound cylinders are one of the easiest and delightful Montessori sensorial materials to make at home. Children love to hear the different sounds each cylinder makes. Beginning discoverers will be content to shake the cylinders, while older tots will be interested in matching the sounds. When presenting the lesson, have one color be the control (eg, blue). Shake the first blue cylinder, then shake the first red cylinder. If the sounds are the same set them aside on the top right of the mat. If they don’t match, then set the red cylinder down in its place. Shake the blue control cylinder again, then shake the second red cylinder. Continue until the first blue cylinder has found its match, then proceed to the next blue cylinder. How to Make: I made 3 sets of sound cylinders (2 sugar, 2 rice, 2 beans) with a red sticker on the first and a blue on the second. I used old, plastic spice jars. After washing, I cut a piece of black construction paper to size and placed it in the jar, then put in the material. For these jars, I wanted the sounds to be very distinct so in order from softest to loudest I choose sugar, rice, then beans. Extension 1: Increase the amount of sound cylinders. Extension 2: Vary the degree of sound by sorting similar sounds (sugar, qunioa, barley, rice, etc). Extension 3: Sort the cylinders from loudest to softest. 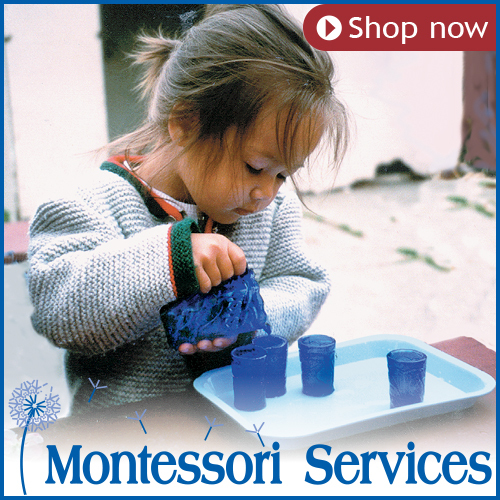 Alternative: Sound Cylinders from Montessori Outlet. 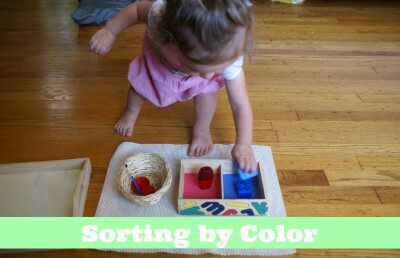 To help a child begin to learn and differentiate their colors, a color sorting activity is helpful. I’d suggest starting with the primary colors (red, blue, yellow). In this activity, I gathered 3 items of two colors. It worked out that I had an old Melissa & Doug container with a divider. It would work just as well with two colored pieces of cardstock on a mat. In presenting the lesson, name the color of the object and place it in the correct spot. Continue until all the items are sorted. Return the items to the basket and invite the child to do the activity. Extension 1: Increase the number of colors sorted. Alternative: After the child is two and three colors well, you could introduce Color Box 1 (from Montessori Outlet). 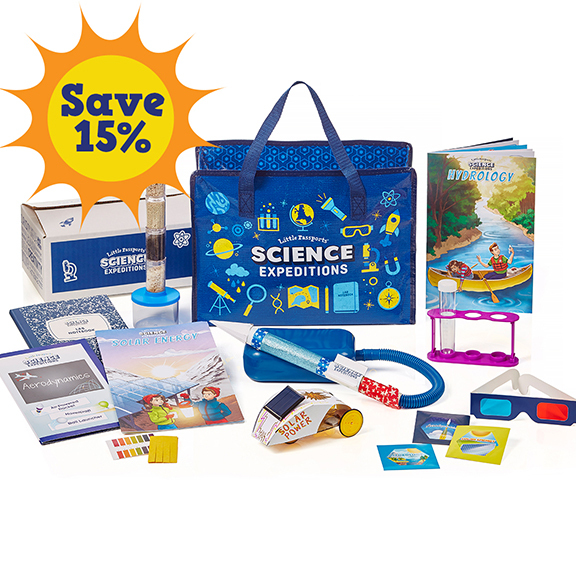 Give the child a variety of textures to feel and explore with a texture box. 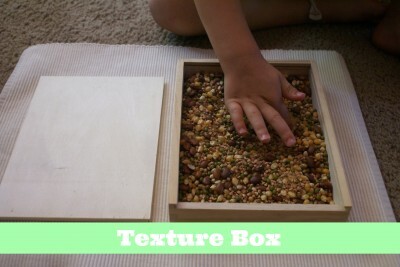 Combine different grains, beans, sand, or river stones for a quick and easy texture box. If you’re looking for more variety consider pom poms, ribbon, fabric, seasonal erasers, or large beads. I prefer a grain-based box, because it mimics the sand tray children will work with in their pre-writing activities. Please keep in mind the age of the child you’re preparing for and whether the objects are too small for eager mouths. Spooning ice is a great activity for a hot summer day or even a rainy day. All you need is two bowls, ice, a slotted spoon, and a towel. 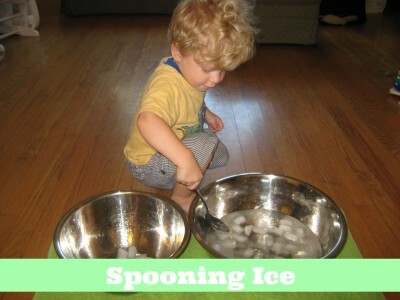 Demonstrate to the child how to spoon the ice between bowls, then invite them to continue the activity. Depending on your mess comfortability, you can add water to the ice. Extension 1: Use tongs instead of a spoon to transfer the ice. Extension 2: Decrease the size of the bowl and the amount of ice and have the child transfer the melting ice with a sponge or syringe. As with the color sorting activity, starting simpler is better. Pick two shapes in the same size (and, if possible, all shapes the same color), on a piece of cardstock draw a line down the middle of the paper, and then trace one of each shape at the top. When introducing the activity, pick up the first shape and name it, “This is a circle.” Then give it to the child to feel. Once the child is done exploring the shape, say again, “This is a circle.” and place the circle on the outline. This will be your control. Do the same for the square. Continue sorting the shapes. Extension 1: Vary the size of the shapes, still keeping between two shapes. Extension 2: Increase the amount of shapes by 1 or 2. 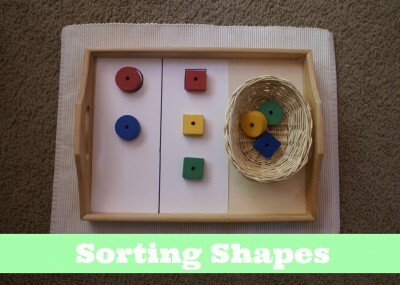 Extension 3: Sort by shape and color. 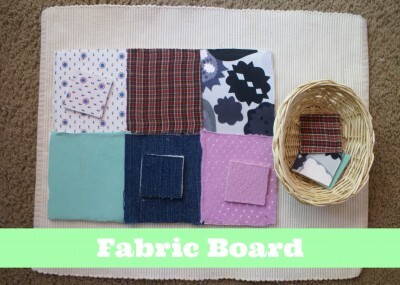 A fabric board is another great way to introduce different textures to the child. This example is a toddler-friendly verison of the traditional Montessori fabric box, because there are less pieces for the child to move. In this activity, take a fabric square and feel it describing the texture in one or two words (soft, silky, bumpy, rough, etc) and then going one by one across the board take the square and ask, “Are they the same?” until you match the fabrics. Continue with the work or have the child continue the activity. How to Make: I cut a piece of styrofoam poster board to a size that would fit on our trays, then glued squares of varying fabric textures to the board with a spray adhesive. For the fabric tiles, I cut smaller squares from balsa wood (you can find at your local craft store) with a craft knife and glued fabric squares to fit. It’s not as pretty as I’d like, but it works. Alternative: For older children, the fabric box might be a good, long-term option. The child matches different swatches of fabric. 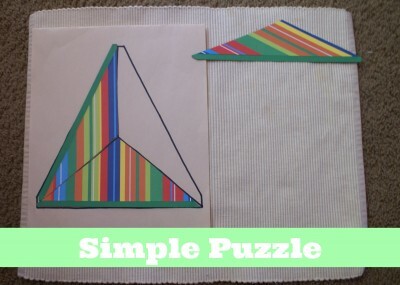 Simple puzzles are a great activity for a child in deciphering size and shape. My ideal first puzzle for a would be a one shape (for younger tots) or three shape puzzle (see the example below from Montessori Outlet). How to Make: Using a picture or a piece of scrapbook paper with a graphic, draw a simple shape (square, triangle, rectangle), then draw a 3 piece puzzle. Cut and laminate, if you wish. Make an outline of the puzzle on another piece of paper as the control. 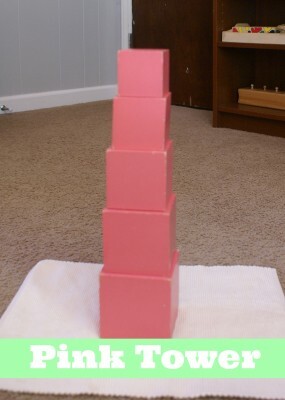 Another option would be to make your own 1-3-piece puzzle of varying shapes out of styrofoam board or balsa wood. I so enjoyed introducing Olivia to the knobbed cylinders. The first day she continued going back to the block. She’d carry each cylinder to me, then after I had all ten she’d come back for them one by one and return them to the block. She’d sit with it in her lap or carry it to different rooms. 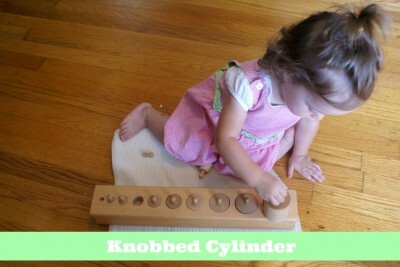 The knob cylinders teach the difference between height and diameter. Block A (shown) decreases in height and diameter. 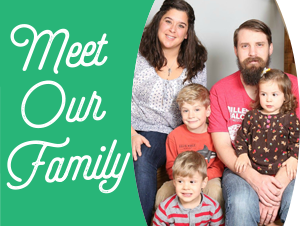 Alternative: Alison’s Montessori carries a toddler set of all four knob cylinder blocks with the first five cylinders in each block. This gives the younger children a chance to work with each block without worrying about the size of some of the smaller cylinders. Note on Ages: For the purposes of these activities, I’m defining toddlers anywhere between the ages of 15 months to 2.5 years. As with all activities, there is not a one age fits all. What one child is able to do at 18 months, another child may not be able to do at 22 months. Each child develops at his or her own pace. 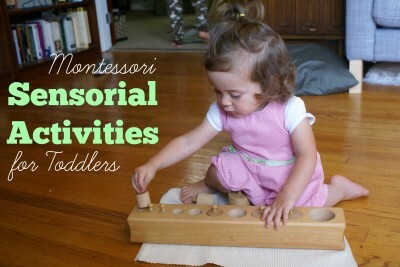 What are your toddler’s favorite sensorial activities? Wonderful post! Extremely helpful list of senatorial activitie ideas! Thank you for explaining, and putting together all activities.